Tweakerbit Registry Optimizer is the PUP that uses misleading techniques to prevent removal. Use Reimage to locate malicious components and get rid of them faster than with uninstall instructions. A full system scan blocks virus reappearance and prevents traffic to malicious domains. 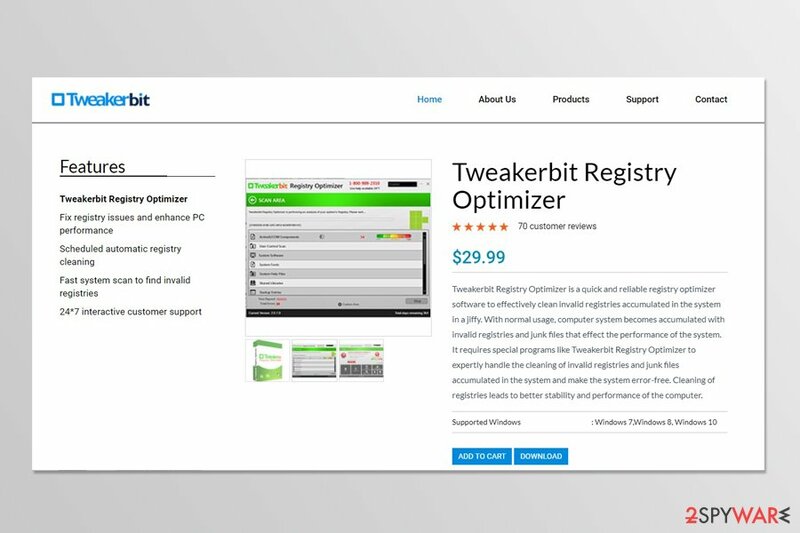 Already installed Tweakerbit Registry Optimizer? Get rid of it right now! Tweakerbit Registry Optimizer pretends to be a legit program that can enhance computer’s performance by fixing registry issues. However, these promises are not real. This tool cannot help to speed up your computer because it operates as a potentially unwanted program. Nevertheless, this PUP has an official website; it still can sneak inside the computer unnoticed and starts system scans. Due to its ability to enter the system silently, it’s often called as Tweakerbit Registry Optimizer virus. However, the term “virus” is not suitable to describe this tool. It cannot cause any direct damage to your device. Though, it doesn’t do any good as well. Once the Tweakerbit Registry Optimizer delivers scan results, it offers to fix them immediately. However, this feature is not for free. Users are asked to purchase a license for $29.99. We can assure that this program is not worth your money. This system tool is expected to deliver fake and exaggerated scan results or report about critical computer’s condition. However, there’s no doubt that it’s just an unfair marketing strategy to convince people that their computers need professional help. However, you should not be tricked by these results. The program also has a phone helpline which is available 24/7. 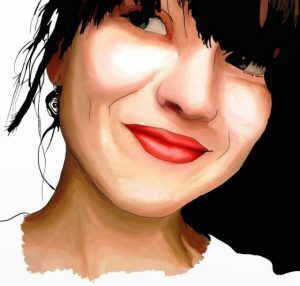 However, you should not get tricked by a beautiful lady’s picture and call 1-800-850-6107 to get more information about Tweakerbit Registry Optimizer. Even if you buy this program, you won’t find any improvements in your computer’s speed. Besides, security experts from Los Virus warn that buying unknown and suspicious programs might lead to a data loss. In order to buy Tweakerbit Registry Optimizer license key, you will need to enter your name, some contact details, and credit card data. Therefore if this information ends up in the hands of cyber criminals, you might suffer from money loss or even identity theft. Therefore, if you have already installed this program, you have to remove Tweakerbit Registry Optimizer immediately. Just go to Control Panel and uninstall it as a regular application. We can assue that this tool will not benefit, so there's no need to let it take space on your PC. However, you should opt for the automatic Tweakerbit Registry Optimizer removal if this tool was installed in the software bundle. All popular security tools should delete this program, but we recommend choosing Reimage for this task. Tweakerbit Registry Optimizer delivers fake scan results to make people to buy program's license. Use Advanced/Custom installation settings instead of Quick/Recommended. Keep in mind that majority of additional apps included in the software packages are browser hijackers, adware or other PUPs. So, you should never agree to install them in order to avoid computer-related problems. Go to Add/Remove programs or Uninstall a program. Find the PC optimization software and hit Uninstall button. However, you can also perform automatic Tweakerbit Registry Optimizer removal with reputable malware removal program. This method is recommended if this tool was installed in a software package. It’s possible that other PUPs may have sneaked to your PC as well. Thus, security tools, such as Reimage or Malwarebytes MalwarebytesCombo Cleaner can clean your computer quickly. Of course, you can use other antivirus or anti-malware tools as well. The majority of them detect this suspicious software as PUP and removes it without any problems. However, don’t forget to update your chosen tool firs! ^ Cara McGoogan. How to protect yourself from credit card fraud online. Telegraph. News website. This entry was posted on 2017-10-06 at 04:03 and is filed under System tools, Viruses. You can quickly scan the QR code with your mobile device and have Tweakerbit Registry Optimizer manual removal instructions right in your pocket. How did you remove Tweakerbit Registry Optimizer?